Not many hydrangeas are scented, Hydrangea macrophylla ‘Ayesha’ is however one of the rare ones that is. Nice cup shaped rounded pink flowers that will be blue in acid soils. A ‘popcorn’ type hydrangea with good flower color in summer as well as nice autumn foliage. This particular cultivar has been available for over 60 years and with the tiny cupped petals is probably a more attractive form than some of the newer ‘ forever ‘ releases. Good deep green foliage that seems to be able to handle the heat without wilting although it does require moisture. Flower colour of this old fashioned cottage garden plant will depend on the ph of the soil so from blue to pink depending on acidity. 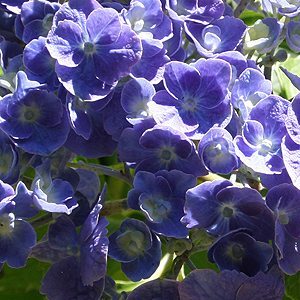 Reaching around 1.5m in height depending on conditions growing conditions for Hydrangea macrophylla ‘Ayesha’ are the same as for other hydrangeas.